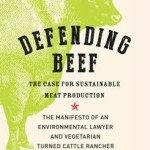 Nicolette Hahn Niman’s Defending Beef is a remarkable synthesis of several important topics. In particular for me, it bridged ecology and nutrition, something I haven’t thought out properly. It also caused me to question some old assumptions from my undergraduate school days regarding the American Southwest, where I live. There are some areas, such as the concepts of over-grazing versus “improper” grazing that I didn’t feel were adequately explained, but for me that means more interesting ideas to investigate. She doesn’t mention Dr. Richard Johnson’s work on the mechanisms of sugar toxicity, or the work of Jeff Volek, Steve Phinney, and others on nutritional ketosis. I noticed some references from secondary sources, albeit not invalid. None of that detracts from the overall message and useful information, presented well. I strongly recommend this book. This is an information-dense work. I’ll mention some aspects that stood out for me. Niman brings an interesting background to bear. She was raised in Michigan with access to the natural world. She majored in biology, then went on to law school. At some point she decided to become a vegetarian. She spent time in the eastern U.S. as an environmental attorney, working for Waterkeeper Alliance headed by Robert F. Kennedy, Jr. There, she learned quite a bit regarding the horrible-sounding environment of confinement animal agriculture. She met and married a famous pioneer of modern sustainable ranching, Bill Niman. She learned to work the ranch and noticed the grassland actually needed herbivores to be healthy. In 2010, her life experience resulted in the book Righteous Porkchop, which focussed on the ills of factory farming of animals. 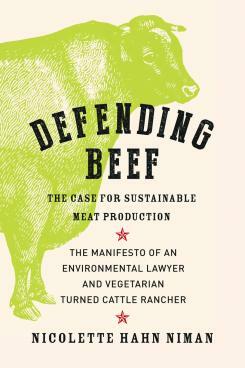 Defending Beef came out in 2014. It seems to summarize some of the key ideas from Righteous Porkchop as part of a much larger discussion of ecology and nutrition. She admits that she still doesn’t eat beef, although her diet has broadened dramatically since her more strict vegetarian days. That actually makes her perspective more unique. In the first section of the book Niman debunks claims that herbivores, specifically cows, are major contributors to greenhouse gases. She points out that grasslands co-evolved with herbivores that eat those grasses. Without herbivores, the grass overgrows and then starts to deteriorate. The herbivore’s droppings, combined with the churning effect of their hooves, fertilizes the soil and mixes seeds back in. She describes the work of Allan Savory, a wildlife manager from Africa who ordered the killing of 20,000 elephants on the belief they were damaging their habitat. When the habitat continued to deteriorate without the elephants, he realized he had made a horrible mistake. He’s dedicated the rest of his life to correcting that by learning about and promoting intelligent range management through the Savory Institute. Niman explains that a proper grassland soil is a complex web of grass roots and commensal fungi which produce the protein glomalin, which binds considerable amounts of carbon. If the grassland is degraded, especially by turning it into cropland, massive amounts of carbon can be lost, adding greenhouse gases to the atmosphere, plus elevated rates of soil erosion. Her thesis is that there are huge swathes of our planet that are best suited to stay grasslands, grazed by herbivores. The best way to get food from those grasslands is to manage them intelligently and eat the excess herbivores. She proposes that those herbivores would be cows in most places because we’ve domesticated them long ago and taken them around the world with us. I think this applies very well to the American Great Plains where we’ve destroyed most of the grasslands for croplands. Output from those croplands depends on huge inputs of energy and chemicals derived from fossil fuels and phosphorus mines, with elevated ongoing erosion of the area’s topsoil. There was undoubtedly a massive carbon pulse when those lands were turned into farmlands. However, according to Niman and Savory, damaged areas, including desertified regions of the world, can be reclaimed as grasslands with proper managed grazing practices. I want to learn more, since that’s very applicable to the American Southwest. In fact, there’s a Savory Hub in Arizona. Back on the Great Plains, I wonder if cows or bison would be a better fit to a restored grassland. 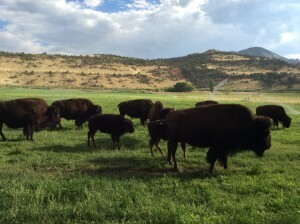 The complication with bison is they are stronger and wilder than cows. We stayed at The Lodge at Red River Ranch when we visited Capitol Reef National Park in 2014. I talked to the ranch manager about their bison herd. He commented that a bison cow he was working with had gotten excited, jumped straight up out of his truck, and done significant damage. Bison was a tasty part of the menu at the lodge. In the section of the book, All Food is Grass, the point is made pretty strongly that most of the food that humans eat are either grasses that we bred into edible crops–sugar cane, rice, wheat, corn,etc.– or animals that eat grasses which we then eat. Several times throughout the book, the excellent point is made that most grassland herbivores are ruminants. Ruminants like cows, bison, sheep, and goats can digest cellulosic, fibrous grasses that humans can’t. This comes back to the point from the previous section. If it’s ecologically least destructive to leave grasslands in a relatively natural state, storing carbon in the soil, the only way to turn grass into something we can eat is to use grazing animals. Niman also makes a very interesting point that civilizations, over and over again, have turned prime lands into farms, farmed until the land deteriorated, then put grazers on the land to get something out of what’s left. It occurs to me that sets up a “who touched it last” scenario, in which the grazers get the blame for the damage. Further on, she presents a truly chilling discussion of just how bad high density captive agriculture is for the animals held captive, the environment, and the people eating the animals. It’s this perversion of traditional animal husbandry that has given modern sources of meat a deservedly tarnished reputation. I found this discussion quite illuminating, since I hadn’t read a clear, concise indictment of captive animal agriculture before. She pointed out that meat cows are a partial exception, because almost all cows spend the first part of their lives on pasture of some sort, eating a normal diet. Then the meat cows go to feed lots for some amount of fattening on corn-based feed. That degrades the quality of the fat content of the meat somewhat, to say nothing of the practice of adding things like antibiotics. I should comment that I think meat from captive animals is still better for the human body than diets high in sugars and easily digested carbohydrates. Also, what drives captive agriculture is cheap petroleum fuels. On the one hand, the vast mechanized farms of the Great Plains with enormous yields only exist because the machines that took over in the 1940s were combined with essentially hydroponic farming techniques of drenching the bare soil with petrochemicals, ammonia, and phosphate to fertilize the subsidized commodity crops and protect them from weeds and pests. What do you do with all that susidized corn? Mostly it’s shipped to the prisons where the animals are kept. The nutrition section of the book is a good overview. It discusses the campaign by Ancel Keys to use fudged data cast as science to promote his conviction that consuming fat caused heart disease. This is a topic I’ve read about repeatedly, but I found Niman’s perspective different, with some details I wasn’t aware of. She does a good job of making the point, which has been made elsewhere, that Americans have actually sort of followed the recommendations to eat less fat and red meat. But strangely enough obesity, diabetes, heart disease, and other problems have gotten worse. She brings the discussion back to the true culprit, sugars and easily digested carbohydrates. There’s no indication she’s aware of the work of Dr. Richard Johnson’s group, which has been investigating the mechanism of toxicity via metabolism of fructose to uric acid. In this she’s in good company, since a number of other writers have claimed that elevation of insulin by glucose is the mechanism, when in fact Johnson says that’s relatively benign. There’s also no discussion of the induction of nutritional ketosis with low carbohydrate diets, i.e. the work of Jeff Volek, Steve Phinney, Tim Noakes, and many others. That’s a missed opportunity, since most of us who stay in nutritional ketosis use healthy animal fats from meat, diary, and eggs as a large part of our diets. There’s an interesting description of the nutritional value of beef. Niman does a good job of showing grass-fed beef is a pretty complete source of an array of micronutrients as well as good fats, proteins, and minimal carbohydrates. Elsewhere, she does a reasonably good job of referencing our genus and species evolutionary history as hunters, although I did notice a date reference or two I might disagree with. In this section, she misses the opportunity to make the point explicitly that the close match between the nutritional value of red meat from cows and our requirements suggests pretty strongly that our lineage has been eating red meat for a few million years, resulting in adaptation to that diet. Her discussion of the iron derived from animal tissues versus plants was new to me. The iron is much more available if derived from animal sources. Toward the end of the book, Niman discloses she’s still not eating cows herself. She’s broadened her diet to include things like eggs, and animal products like butter and cheese, I think. I’ve seen this before in people who have spent years conditioning themselves to a vegan or vegetarian regime. Although they know intellectually that eating meat is OK, they often find it distasteful. Overall, Nicolette Hahn Niman has written a book that brings a unique, valuable, and broader perspective to the discussion of human food and the environment we live in. There are a number of questions I have regarding some of the ecological implications of her claims. That just makes the book more thought-provoking. It doesn’t detract from the fundamental ideas that we can’t eat grass, herbivores can, and that turning grassland into farms is a serious source of environmental damage. We need some farms, but we aren’t having rational conversations about the best use of and management of ecosystems for our long term, enlightened self interest. This book is an excellent starting place for those conversations.